This exclusive beach break and Dunn's River Falls Adventure begins with a short drive from the Ocho Rios pier or Ocho Rios resort. 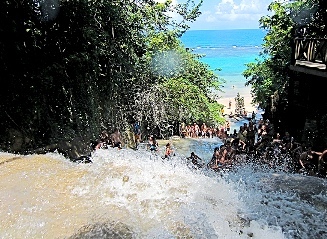 The highlight of your day will be the visit to famous Dunn’s River Falls, a 600-foot high waterfall cascading over smooth boulders. An experienced guide will lead your climb up the spectacular waterfalls. If you do not wish to make the entire climb, you may choose to relax in one of the naturally formed freshwater pools and enjoy the refreshing waters. After your waterfall adventure, we head to a private beach bar and grill. Enjoy a variety of activities, or relax and enjoy authentic Jamaican style lunch while listening to the sounds of Caribbean music. *We are very flexible! If you need more beach time, just let us know! We had a great time at the falls, the driver was very nice and very informative. It was easy finding Jaital when we got off the ship. We didn’t love the beach, wasn’t much to do very small. Over all the experience was good. If we ever go to Jamaica again we would book with you again. Our driver was awesome. He went above and beyond for us to have a great experience. We found this company online after reading the reviews and decided to try them out. They were superb from start to end. When we got to the falls there was a huge crowd but with Jaital, no problem! No need to wait in long lines...Our driver went straight to the window and got our tickets and we moved right along. We had a wonderful time at the beach too...The water was clean and the food was great! We will definitely book with you again! Our experience with Jaital was nothing less than the best. The driver and guides were very knowledgeable and friendly. Our day with Jaital was perfect! Everything went smoothly from check in with our Jaital agent to hike the waterfalls. We had a delicious lunch at the beach and Jaital was on time all the way! We had a great time. Thank you to all who made the tour fantastic. We were not a fan of the private beach with lunch however it was authentic and we got to see how the Jamicans lived and ate. 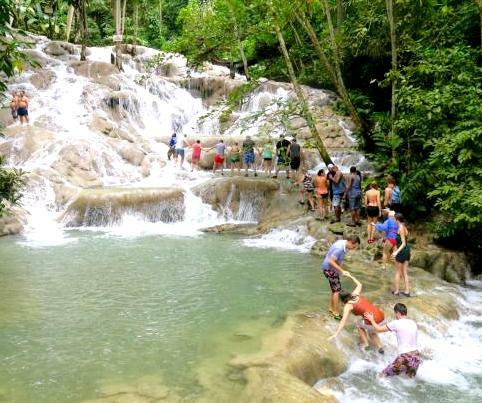 The excursion in Ocho Rios was perfect! Both the driver and tour guide were very pleasant and kept us informed all along the way. The experience was awesome, excellent service, both driver and guide person. I really appreciate their help, info and patience. I will definitely recommend you guys!! We had a great trip and tour. Easy to book and reasonable price. Our driver was easy to locate and very personable. He was prompt as well. We loved our tour, Even though it ended up pouring rain and we had to leave the beach early. We were a little disappointed in how expensive the beach was that we went to... $10 for a chair (that we could only use for 5 min, due to the heavy rain) was a little steep. And the food and drinks prices were very high too. So, another beach would maybe be a better option. We had to cut our tour short and contacted our driver, who came back quickly to get us. Overall, a nice tour. Will definitely go back to the Falls. Both driver Orlando and guide(lovely girl forgot her name) were great. Loved the ease of the website too. Many thanks to our guide and driver who made sure we had a great day! The falls was beautiful. This was our second time in your beautiful country. Thank you for a wonderful experience. We will tell others about your service. Thanks for a great experience. Our guide was very patient and helpful at the falls. Our driver made the experience even better. He was waiting in us when we finished climbing and took us straight to the beach. The beach was clean and not very crowded. We had a very relaxing day, much needed after the falls. We had an excellent experience. We booked all 4 tours with Jaital and we were not disappointed at all. We will use your service again and recommend others. I cannot say enough wonderful things about my experience with Jaital. My driver, Orlando, and his assistant, Stacey, were absolutely wonderful. We had a little mixup about time and were early, and they made sure that we had a comfortable spot to wait and even showed up much earlier than they had to. The check in process was so easy. Orlando went out of his way to tell us every thing we needed to know, and even brought us to a great restaurant upon our request to have even more of a Jamaican experience. We learned so many things about the culture and are so eager to get back. Stacey even gave us her phone number and email address to contact her in case we ever are back. Jaital will 100% be recommended by me and I am looking forward to get back and take another tour from Orlando and Stacey. Thank you so much for our wonderful experience! I took the same tour two years ago and saved money to bring my family back. kids loved it! We had a fabulous day. First we climbed the falls and then we went to relax at the beach. It was very relaxed. Will definitely use JAITAL in the future. Thank you soo much for making our short time in Jamaica absolutely fun. We decided to do the falls and beach tour and we are more than satisfied with the services we received. Our driver was on time, very professional and entertaining. Our drive to the falls was very educational. At the falls, we had so much fun. We wish we did not have to go back home. We climbed all the way to the top and it was soooo much fun. The beach was just what we needed after the fun falls. We had some real Jamaican food and a couple beers. What a relaxing day it was. We never wanted it to end. We are so happy we book with you, its more than value for money. Will always use your service. Many Thanks! Overall, the trip went very well. We were especially pleased with our driver. He was a great help and really made the trip fun. The restaurant we ate at was excellent, and the guides at the Falls were very enthusiastic and fun. Great work, guys! I would recommend you and use you again!